Sheet: 15 3/8 x 20 1/2 in. A rich impression printed in brown ink, in fine condition. Munch added additional drypoint in this state, primarily in the looming shadow and over the woman’s thighs, and a small number of hand-wiped impressions were printed in this state. 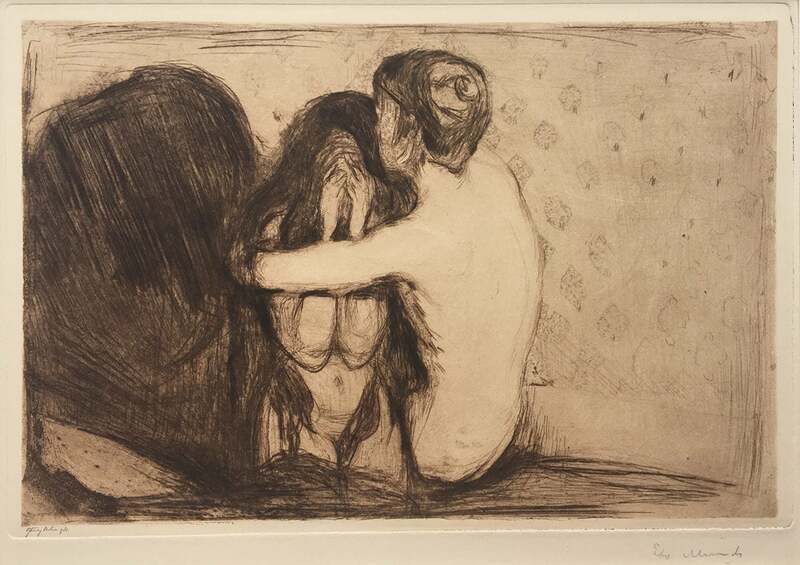 Especially in the deepening of the dark and oppressive shadow, Munch heightened the sense of melancholy. The swirling hair around the woman’s body adds to the sexual undertones. It was a subject that intrigued him over the years, and he used this same couple in several drawings and a similar painting of 1907. Munch goes far beyond a literal reproduction of the real world and Consolation is an iconic subject for the artist. A rich impression printed in brown ink on a large sheet, in fine condition.